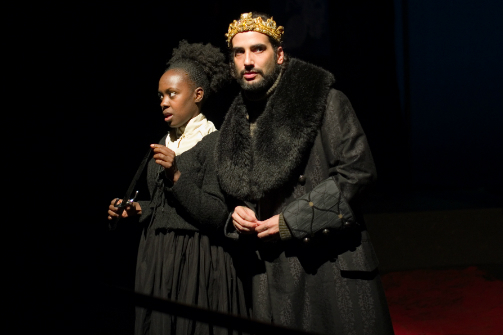 Lavita Shaurice and Antonio Minino in Macbeth of the Oppressed. Photo by Michael Dekker. BOTTOM LINE: The status quo for relationships and society has changed entirely, but human nature’s bloodlust for power is ever the same. In the infinite deliberations over Shakespeare’s texts, gender is by no means a new theme. Sexual orientation has also joined the discussion in recent decades. Here, Tom Slot attempts to tackle both, along with a splash of multiculturalism, in his adaptation Macbeth of the Oppressed. In Slot’s reimagining, the Macbeths are husbands and the Macduffs are wives. But this adaptation makes statements on far more than just gender; Slot’s inviting his audience to pay close attention to very subtle yet bold details, and unless you’re looking for them you may miss them. Slot follows mostly the same plot and language as Shakespeare’s Macbeth—all that changes are the genders of certain characters. In the middle of a battle the three witches (Lavita Shaurice, James Edward Becton, and Briana Sakamoto) plan their encounter with the ill-fated Macbeth (Antonio Minino). Then, while discussing their recent battle victories, Macbeth and Banquo (Elisabeth Preston) are interrupted by the witches and their two premonitions: Macbeth with soon be Thane of Cawdor and eventually King of Scotland, meanwhile Banquo will birth a line of kings. The two remain skeptical until they receive word that, due to a previous thane’s treachery, Queen Duncan (Susan G. Bob) has pronounced Macbeth…you guessed it, Thane of Cawdor! Thus begins the downward spiral of both Macbeth and his husband’s (David Stallings) quest for power. Though their plots are successful, the means to the Macbeths' ends leaves behind a trail of enemies. The Macduff wives become especially wary, but Macduff’s (Mel House) last straw is Macbeth’s order to murder her wife (Taylor Graves) and their children. This gender flopped production does make some very intriguing statements. I enjoyed how both homosexuality and assertive women are portrayed as known and accepted facts of society. The Macbeths and Macduffs don’t need to comment on or defend their relationships, and characters like Banquo don’t need to justify their convictions. Preston’s performance as Banquo is especially empowering. The moment she walks on stage, she commands her space, portraying Banquo as a woman unafraid to share or even take the spotlight from Macbeth. Shaurice, Becton, and Sakamoto are also wonderful to watch as the witches. Their chemistry as an ensemble is no less than perfect. And I love how they also play the murderers and soldiers Macbeth hires throughout the play—it visualizes their ubiquitous power. The design and staging are equally beautiful. I loved the choreography for the dinner scene when Macbeth sees Banquo’s ghost. And lighting designer Daniel Gallagher’s use of downstage lighting is fascinating; with very simple use of what I assume were footlights, Gallagher creates enormous shadows behind Minino and Stallings, as if the Macbeths’ ambitions are monstrously larger than they can possibly handle. In many respects this is a very different Macbeth—or at least it’s Macbeth with a different set of lenses. But, the role of “the Oppressed” part of the title may not necessarily be clear to most audiences. It seems to be a play on the term “theatre of the oppressed.” The trick to understanding this production is in three sets of simple yet important facts: the cast is wonderfully diverse (at least compared to most productions seen on city stages), exactly half those cast members are women, and many prominent characters’ genders and relationships are switched. Put these three facts together and you create a production that gives resounding voice to those who society would rather ignore. And to superimpose these ideas onto a play about power is incredibly smart. Creating a world in which diversity, gender, and sexual orientation need little comment is a smart choice, but if unnoticed the show risks seeming like it’s only yet another variation on yet another Shakespearean play. After countless re-worked and re-imagined Shakespearean plays done around the world with variations on gender, cultural, and racial casting, making a Shakespearean adaptation stand out to 21st century audiences is challenging. Otherwise, Macbeth of the Oppressed is a fine production that will make you think. Ensure you bring friends who enjoy a good post-show discussion.